Interview with Rob Janoff, designer of the Apple (Macintosh) logo. The Apple logo is one of the most famous logos in the world. Apple fans not only put this logo on their vehicles to show their loyalty, they go to the extreme of tattooing themselves with it, a level of dedication very few brands achieved. The logo is admired for it's simplicity and many meanings that people attach to it. It's timeless. For 30 years it has been unchanged and I expect at least another 30 before anything drastic will be done to it. One of the deep mysteries to me is our logo, the symbol of lust and knowledge, bitten into, all crossed with the colors of the rainbow in the wrong order. You couldn't dream of a more appropriate logo: lust, knowledge, hope, and anarchy. There are many theories about this logo and many of them are just that. Find out the truth, read the interview with Rob Janoff, the designer of the original Apple logo, who will tell you all about his design. CB: When did you design the original Apple logo with the colorful stripes? RJ: Early 1977. The agency got the account (Apple) sometime January. The logo was introduced with the new product Apple II in April of that year. CB: Were you working for an agency at the time? RJ: Yes, I was working for an advertising and public relations agency called Regis McKenna and I was an art director. CB: Have you met Steve Jobs? RJ: Sure. The first time must have been that first year. It was before he was getting his company started. So it was just Steve Jobs, Steve Wozniak and Mike Markkula. His was the elder guy who corralled these young entrepreneurs. And I think it's because Mike Markkula is how the account wound up at our agency. He was friends with my boss Regis McKenna. CB: Did you get a brief from them? RJ: Really there was no brief. But the really funny thing was the only direction we got from Steve Jobs is: "don't make it cute". There were briefs on subsequent jobs. First there was the logo, then there was an introductory ad and a sales brochure for the upcoming introduction. But it was pretty lose at that time. There was a previous logo to my logo. It was a logo done by Ron Wayne who was a very brief partner of the two Steves early on. He later took a buy-out, because he was a little concerned about the financial obligations he might have. He had a young family and the other guys didn't. Ron did a pen and ink drawing of Sir Isaac Newton sitting under an Apple tree with a poem all around the border. 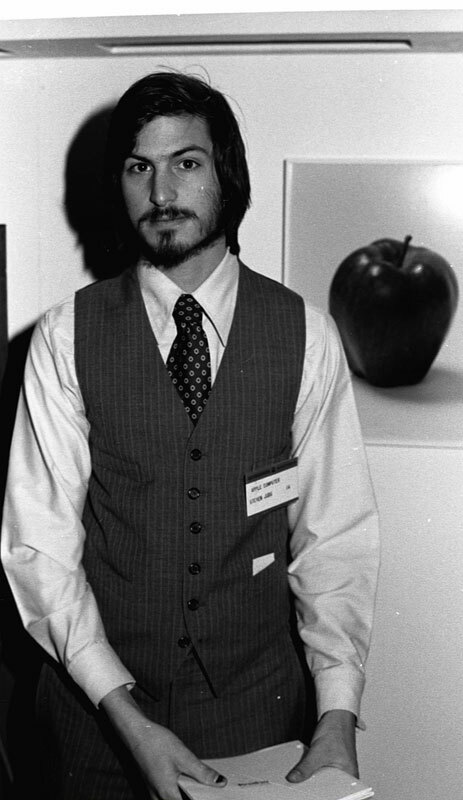 And, I think when Steve Jobs started to get serious about the Apple II and getting a prototype for the design of the shell he realized that logo would not do. So he needed a new logo. CB: How many versions did you do for the presentation? RJ: We presented two versions of the logo. One with and one without the bite. Just in case he thought the bite was too cute. Fortunately he went with the one that gave it the most personality with the bite. Frankly it was a no brainer and you would miss the mark if you don't show some kind of an apple. When I presented I showed him several variations. Striped version, solid color version, metallic version. All those with the same shape. CB: So even then you knew you needed a solid color version and a metallic version? RJ: Yes, you kind of had to. When you're doing printing of either one or two color you need to have some way to go and I realized that the stripes would not always get it. The stripes really didn't work as a greyscale halftone. CB: Do the colors represent the hippy culture, which was in fashion at the time? RJ: Partially it was a really big influence. Both Steve and I came from that place, but the real solid reason for the stripes was that the Apple II was the first home or personal computer that could reproduce images on the monitor in color. So it represents color bars on the screen. Also, it was an attempt to make the logo very accessible to everyone, especially to young people so that Steve could get them into schools. CB: At the time most logos were single color or 2 color logos. Anybody fought against the color stripes? RJ: Steve liked the idea, because he liked things that were outside the box. And, it's not so revolutionary now, but it was a little different then. However I did get a lot of opposition from one of the higher account executives at agency. He was sort of working against me on the meeting where I presented the work to Steve. He made a comment that if this new company went ahead and produced stationary in all these colors they will go bankrupt before they start the business. That was kind of the attitude that I was facing from the agency. But Steve liked it right off. He's a pretty perceptive guy as we later learned and he liked the uniqueness of it as well. Also, I should add that the idea of a computer going into people's homes was a little bit threatening because up to then computers were for big businesses, who were highly technical and sensitive and all that stuff. Most of the personal computer products that were coming out at the time had very techno names. TRX80 and things like that, so that's why the name Apple was so golden because it was basic and not technical and to go with that the colors were very important. CB: What does the bite in the apple represents? Is it a reference to a computing term byte? Is it a reference to the biblical event when Eve bit into the forbidden fruit? Is the fruit itself referencing the discovery of gravity by Newton when an apple fell on his head while sitting under the tree? RJ: They are really interesting, but I'm afraid it didn't have a thing to do with it. From a designer's point of view and you probably experienced this, one of the big phenomena is having the experience of designing a logo for whatever reasons you design it, and years later you find out supposedly why you did certain things. And, they are all BS. It's a wonderful urban legend. Somebody starts it and then people go "oh yeah, that must be it". CB: Is it possible you were influenced subconsciously by these stories? RJ: Well, I'm probably the least religious person, so Adam and Eve didn't have anything to do with it. The bite of knowledge sounds fabulous, but that's not it. And, there is a whole lot of other lure about it. Turing the famous supposed father of computer science who committed suicide in the early 50's was british and was accused of being homosexual, which he was. He was facing a jail sentence so he committed suicide to avoid all that. So, I heard one of the legends being that the colored logo was an homage to him. People think I did the colored stripes because of the gay flag. And, that was something really thought for a long time. The other really cool part was that apparently he killed himself with a cyanide laced apple. And, then I found out Alan Turing's favorite childhood story was Snow White where she falls asleep forever for eating a poisoned apple to be woken up by the handsome prince. Anyway, when I explain the real reason why I did the bite it's kind of a let down. But I'll tell you. I designed it with a bite for scale, so people get that it was an apple not a cherry. Also it was kind of iconic about taking a bite out of an apple. Something that everyone can experience. It goes across cultures. If anybody ever had an apple he probably bitten into it and that's what you get. It was after I designed it, that my creative director told me: "Well you know, there is a computer term called byte". And I was like: "You're kidding!" So, it was like perfect, but it was coincidental that it was also a computer term. At the time I had to be told everything about basic computer terms. CB: You obviously didn't design the logo on computer? RJ: Actually, and it's a revelation to a lot of young designers. I get emails about the logo all the time asking me questions about the logo from all over the world and it's really kinda very satisfying because it's not something every designer gets a chance to talk to everybody because of some work you did. And, people ask me: did you design it on a computer? And of course at the time computers couldn't really do that for me. It was only years later till the Mac was designed, developed and refined that I even start working on a computer. At the time it was all pencil and paper, glue and cut paper, pens and all that stuff. CB: How does it feel to see your logo everywhere? RJ: It's a real unique experience that still makes my day whenever I see it unexpectedly. You're watching a movie or tv and usually when they have a cool character they'll have a laptop with an Apple logo on it, like Meryl Streep in The Devil Wears Prada. I've done a lot of traveling and early on when the logo still had multicolored stripes on it I was in China and there it was on a billboard somewhere. It was Chinese script that I couldn't read, but something that came out of my head was up there for all to see and to interpret. It's kind of a personal thing. It's kinda like having a kid. You're very proud of it. CB: Do you like the changes Apple made to your original design over the years? RJ: I do like them. The stripes served their purpose and they are definitely dated. I think it's very important that a product like Apple keep very up-to-date and Steve Jobs is obviously very conscious of that and he has fabulous designers working for him in industrial design and graphic design. I feel great that it's still the same basic silhouette even though it went through lots and lots of changes. The apple shape changed slightly from my original design in the early 80's. The design firm Landor & Associates made the changes. They brightened the colors, they made the shapes much more symmetrical, much more geometric. When I designed it I pretty much did it freehand. I often think to myself why didn't I do that. It's because it wasn't where I was coming from at the time. I think they did a great job and it will be fascinating to see the next iteration and how it works out. CB: What other projects are you proud of? RJ: People assume that I continued in a pure design mode and did lot more logos. I did some logos, but my career path is more about advertising, which meant print and TV advertising. As far as image or logo type of thing there is really nothing that tops or comes close to the Apple logo. It's kind of a problem when you do something that so well known, so early on in your career. It's all downhill from then. I was proud of all the things I was involved in. How to do a television commercial, which really does take a while to understand. Those were the things that kept my interest. In advertising you work with words and images together, you work with more people. There is more a chance to come up with imagery that has double meanings, has to do with colloquialisms and all that. That's a long way of saying, there is nothing else that I'm as proud of and things were very different from then on. CB: Do you use Macs today? Do you still work? RJ: I'd really like to retire, but in this economy I really can't. I do work on a Mac, it's all I ever worked on. I would not know what to do with a left and a right . Been brand loyal all the way, even though the products cost a little bit more. I wouldn't think of using anything else. Plus, for graphics and design Apple has it all over Microsoft. CB: Can you tell me a favorite logo of yours that is not designed by you? RJ: There is a lot. I really do like other classic designs. Volkswagen because it's very clear what it is and it's been around for so long. I'm trying to think of other logos that incorporated the multicolor and I thought of NBC logo. I like logos with a relationship with positive and negative spaces, where something is revealed. CB: Like the FedEx logo? RJ: Yes, that's another one that I enjoy so much. It's very simple and if you study it you get the dynamic element of it with that arrow. Those are the kinds of logos I respond to. CB: Can you give me the most important things to watch out for when designing a logo? RJ: The main thing is to make it simple, because designers especially young designers tend to over-design or clients want too many things in there. I think people who tried to work a logo too hard, having too much meaning, wind up with something that's too complex. Logos usually have to be interpreted from very-very small to very-very large and that's not always easy. So, I think simplicity and readability is key. You're designing for an audience who really doesn't care as much as you do and unless it catches their interest right away they are going to pass right over it. So having it very readable is also important. Capturing the audiences imagination by having something revealed to them as they look at the logo is also important. Also, it's an opportunity to give whatever you're trying to portray a personality — this is something I try to do. CB: Huge percentage of designers never receive formal education. Still some of them are doing great work. Do you think formal education is necessary? RJ: Well, I don't think it's necessary, because I think I've learned most of the knowledge about graphics after I started working, not in school. I do think though that someone who is a successful designer has innate ability to see in a certain way. I know that I do. I tend to be a very visual person as opposed to verbal and I think that's a real important quality. Unfortunately now everyone has all of the tools at their disposal regardless whether they have any talent for designing. Everyone thinks he's a designer by pulling down a filter in Photoshop. So, I think no, you don't need all that much formal education and things can be learned obviously when working at it. CB: Final question, what is your suggestion to our younger readers, what should they focus on to become great designers? RJ: This is something I tell my kids: I could do this even if I'm not getting payed for it, because I like it so much, because now more than ever before there are so many people trying to become designers and work for agencies just because the tools that are available. So, it's harder and harder to get work. And, the way some people have to get work is by apprenticing and working for nothing for somebody until they get that job, because there is so much competition.